Mythical weapons are weapons are believed to be non-existant and merely a part of legend, however sometimes weapons considered to mythical are actually discovered and lend credibility to the legends themselves. Mythical weapons are often considered to have magical powers or to have been used by a legendary person. Mythical weapons are often highly sought after, and very expensive. Also known as the sword of Mars or Sword of the War God. Legend tells of a certain Shepard who noticed one heifer of his flock limping and couldn’t work out the cause of the wound. He anxiously followed the trail of blood until he came across a sword, it had unwittingly trampled while nibbling the grass. He dug it up and took it straight to Attila. He rejoiced at this gift and, being ambitious, thought he had been appointed ruler of the whole world, and that through the sword of Mars supremacy in all wars was assured to him. The sword now rests at the Kunsthistorisches Museum of Vienna. The Sword of Goujian was discovered in 1965, in Hubei, China. The sword is mysteriously sharp and untarnished considering it’s age. This something that is rarely seen in artefacts over 2000 years old. They eventually worked out that the sword belonged to Goujian who was king of Yue during the Spring and Autumn period of Chinese history. Goujian is a famous king in Chinese history, he fought and lost in a war with the state of Wu, and lived in humiliation because of it. He was forced to sleep on thorny firewood, and eat the bile of a gallbladder everyday. 10 years later he went to back to war with Wu again, and this time won with the legendary sword in his hand. 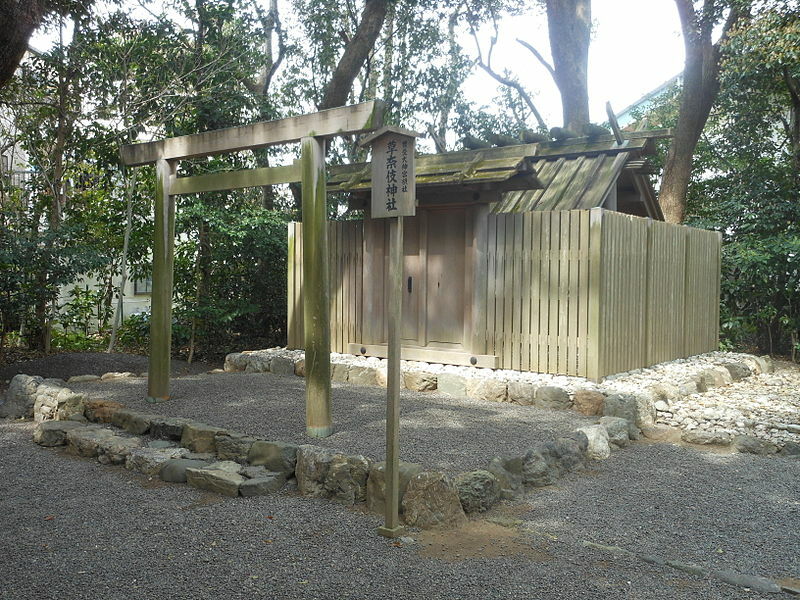 The Seven Branched Sword was discovered in Isonokami shrine in Japan. The sword was clearly unusual, mainly because it had seven tips instead of one. Even as mythical weapons go, this one was strange. The sword turned out to match the one described in a folklore called Nihon Shoki. 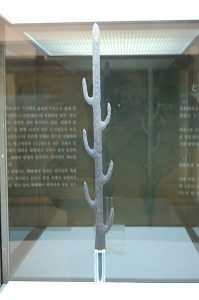 The sword has a mysterious enscription on it that reveals the sword was made by a king Baekje, an ancient Korean king, to the king of Wa, who was the ruler of Japan. The dating on the sword matched sources from China, Japan and Korea which lends credibility to it. The ruler of Japan was Empress Jingu, who is just as mysterious as the sword, historians cannot work out if she was real or mythical, but the existence of this sword lends credibility to her existence. 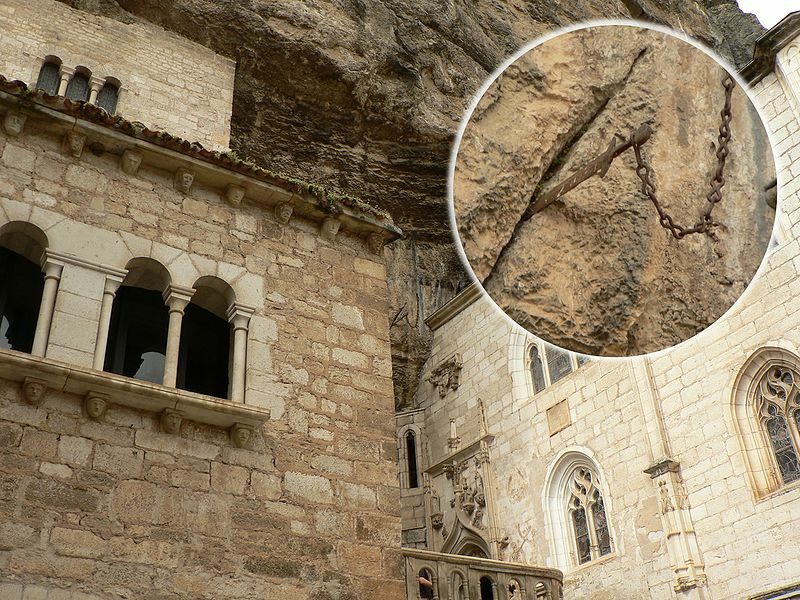 For years a sword has been lodged in the cliffs above the Notre Dame chapel in France. Durendal means “to endure”. The sword was made by a blacksmith known for making mythical weapons, called “Wayland the Smith”. Legend tells that the sword was brought by an angel to Charlemange, who gave it to Roland. The hilt of the sword is full of legendary items, inside is one tooth of Saint Peterm the hair of Saint Denis, a piece of raiment of the Virgin Mary, and the blood of Saint Basil. 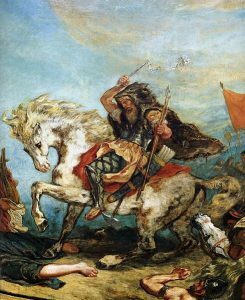 The sword is said to be the sharpest in the world, and Roland supposedly managed to hold off a hundred-thousand-strong Muslim army. 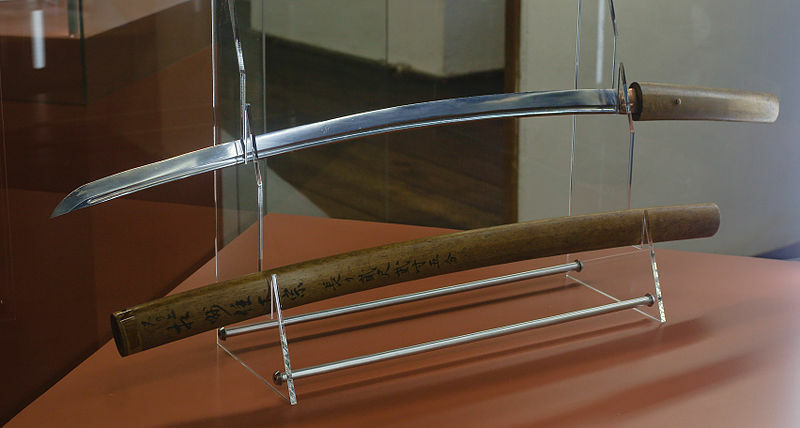 Kusanagi-no-Tsurugi is a legendary Japanese Katana currently in the possession of the Japanese royal family. It’s name translates to Grass-Cutting Sword. The god Susanoo encountered a family in grieving. He learned that the family was being ravaged by an eight headed serpent of Koshi, who was consuming the family’s eight daughters one at a time, and only one was left. The serpent was now coming for his final daughter, Kushinada-hime. Susanoo agreed to slay the beast in return for Kushinada-hime’s hand in marriage. Susanoo set a trap for the beast, he prepared eight vats of Sake to be placed on individual platforms behind a fence with eight gates. The beast fell for the plan and stuck it’s head into each of the eight gates. While it was distracted he quickly killed it, and found the Kusanagi inside it’s body. Zulfiqar is the sword of the Muslim leader Ali ibn Abi Talib, it’s said to have been given to him by Muhammad. It’s one of the most famous mythical weapons in the Muslim world. It was given to Ali at the battle of Uhud. It was reward after he split the shield and helmet of the Meccan’s strongest warrior. His own sword shattered in the same stroke. The sword was brought by Gabrial “Lord of Angels” as an order from Allah. Ali is commonly drawn holding the sword. It’s said that Ali used the scimitar at the Battle of Trench. Middle eastern weapons are commonly inscribed with a quote mentioning Zulfiqar. Muramasa Sengo was an evil Japanese swordsmith, who prayed to the gods that his weapons would become great destroyers. Muramasa was a violent man prone to outbursts of violence, but he was also an exceptional swordsmith, and because of the quality of his sword, the gods granted his wish. The swords were given a bloodthirsty spirit, that would drive it’s wielders to murder or suicide. The mythical weapons went on to cause devastation. The swords even managed to kill almost every family member of Tokugawa Leyasu. The Shoguns father and grandfather were both killed by servants wielding Muramasa blades. Only a handful of the mythical swords still remain after Leyasu banned them. Masamune is the most famous and respected swordsmith in Japanese history. His swords are said to be of the highest quality, but are almost impossible to find. He made most of his swords in the 13th and 14th century. Masamune is said to have been challenged by his pupil Muramasa to see who could create the superior blade. They worked tirelessly on swords, and then put them to the test. The test was for each of them to put their swords in a small creek with the blade facing the current. Muramasa’s sword called, “called 10,000 Cold Nights”, cut everything it touched, leaves, fish, and even the air. Masamune then lowered his sword, “Tender Hands” into the stream. Masamune’s blade only cut the leaves, and left the fish and air alone. Masamune’s was the finer sword because it only cut leaves, where as Muramasa’s blade was evil and would cut anything it touched. The Sword of Mercy, also known as Curtana, used to belong to Tristan, a legendary knight of the round table. It’s now one of the Crown Jewels of the United Kingdom. The point of the sword has been broken off, this symbolizes mercy. There are many legends explaining how the sword lost it’s tip, one says that Tristan left the tip in the Skull of Morholt, another claims an angel broke it off to stop the killing of the son of Charlemagne. 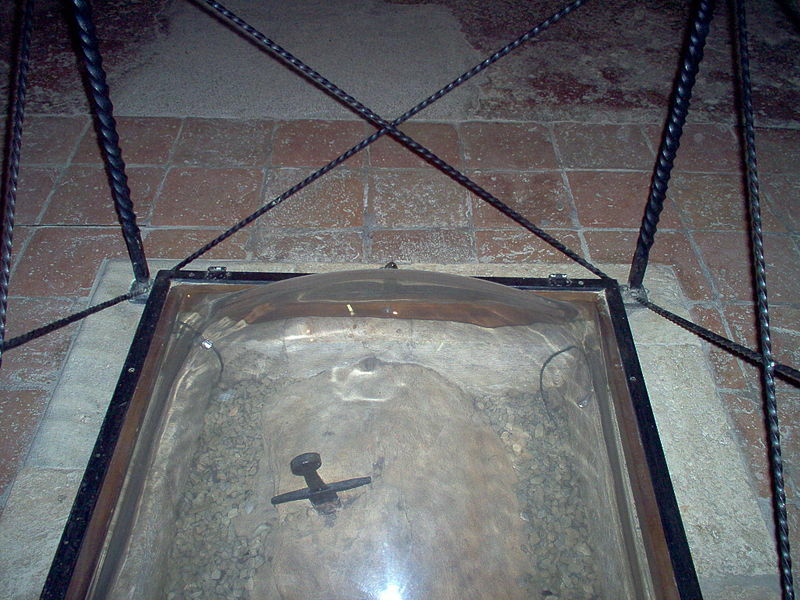 The legendary sword in the stone of San Galgano can be found inside a chapel on top of Montesiepi in Tuscany, Italy. Galgano was said to be a ruthless man when he was younger but turned over a new leaf when he saw the Archangel Michael in a vision. After his vision, his horse refused to follow orders and led him to the hill of Monte Siepi. He was convinced that this was a sign and decided to plant a cross in the ground. In one of his visions he was told to renounce all material things. He said it would be as easy as splitting a rock, and tried to prove his point by trying to plunge his sword into one. 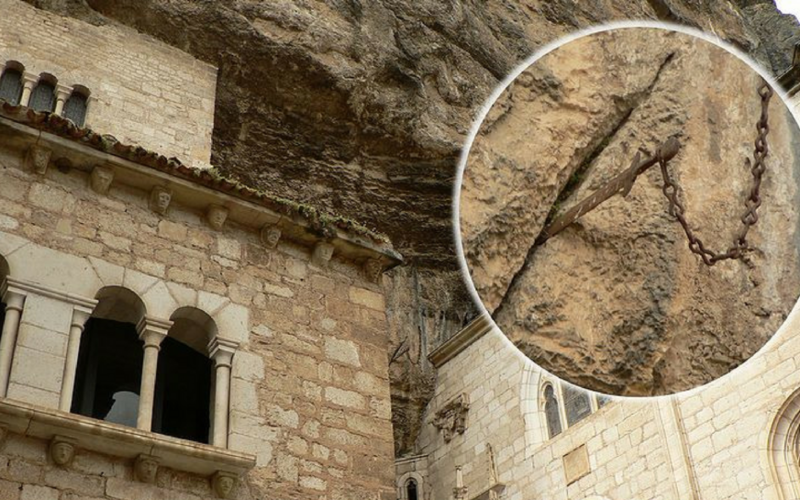 As he did this the sword went straight through the stone like butter.